Although some of the products shown will be temporarily unavailable, they remain good examples of what you can make with Quilt Fairy Piecing Papers. English Piecing Papers and Pre Cut Hexagon Fabric Packs will be and can be posted to you by contacting me on 0412 306 292 or emailing thequiltfairy@iinet.net.au or have a look at “Come & See Us” for a complete calendar of dates for our Pop-Up Shop in 2016. 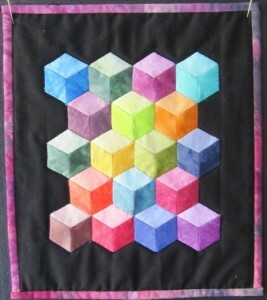 Paper pieced with 1″ Sixty Degree Diamonds and Hexagons these six pointed stars, die cut from Cotton Patch hand dyed fabrics are separated by black background Hexagons. The finished pieced panel is floated onto a background fabric to give a border effect. Paper pieced with Thimble piecing papers using die cut charm fabrics cut from small prints ,spots etc. Good Beginners project Machine pieced. Eighty medium tumbler shapes cut from pastel prints. Can be hand or machine pieced. Paper pieced with Small Spools papers and fabric spools die cut from charm fabrics… small prints ,spots etc. Background fabric and contrast binding is supplied. 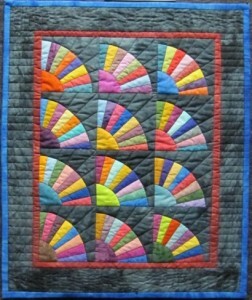 Kerry’s Appliqué Spools Quilt…Pre-cut and ready to go. 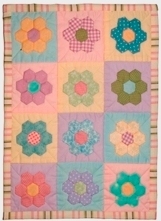 This cute nursery quilt is ideal for a spools beginner. 1.5 metres of white “tone on tone” background fabric and colour coordinated bias binding strips,can be purchaced separately…..$40. Background fabric is not included. calico, pale yellow or a soft green. Plus stars to Die cut iron stars to embellish your quilt. calico, lavender or a soft green. Each unit is made up of a central hexagon, six irregular pentagons to make the star set in six diamonds. Two sizes available both suitable for wall hangings. One Y shape measures 6″ across. the pieced panel and stitch onto your background fabric. Mini Equilateral Triangles … Pre cut and Ready to Go 130 Equilateral triangles cut from Cotton Patch hand dyed fabric. 756 matching 1″ Hexagon Piecing Papers. 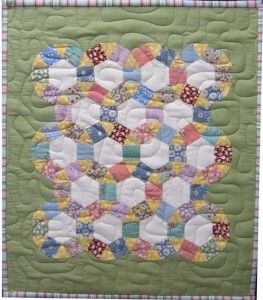 The background fabric onto which the hexagon pieced panel is sewn is not included. 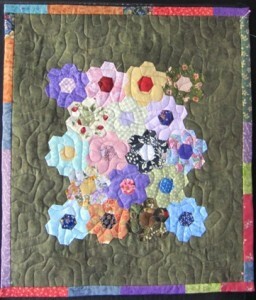 The plates can be purchased separately to make the quilt you desire. Each plate consists of 16 blades and a centre circle. The blades are cut from a large stock of blue and white or 1930’s fabrics. pieced panel is appliquéd is not included.